A year and 2 months. That's how long it took us to prepare for our Maldives vacation from the moment we purchased our Kuala Lumpur - Male tickets from Air Asia's online promo. After booking the flight, the next main consideration was the accommodation whether we can afford to stay in an island resort or in one of the local islands. 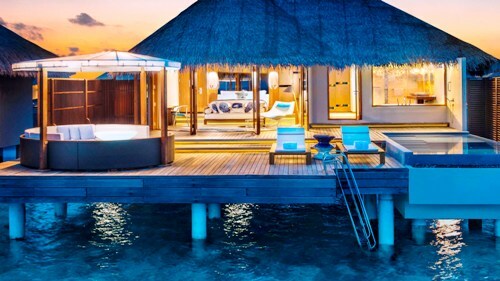 While the true Maldivian experience I have in mind is waking up in a stilt cottage in the middle of the blue ocean, my bank account simply cannot afford shelling out at least Php92,500 (Usd1,915) per night on a Fabulous Lagoon Oasis room at the W Maldives - the no. 2 destination on my crème de la crème bucket list! Going back to reality, my friends let me decide which hotel to book with the following conditions: it must not cost an arm and a leg, must be clean and well maintained, offers complimentary breakfast, can accommodate the three of us comfortably and the hotel must have an in-house pool. Tripadvisor and Agoda narrowed down my options to several hotels and resorts in Maafushi, a local inhabited island in the South Male Atoll. 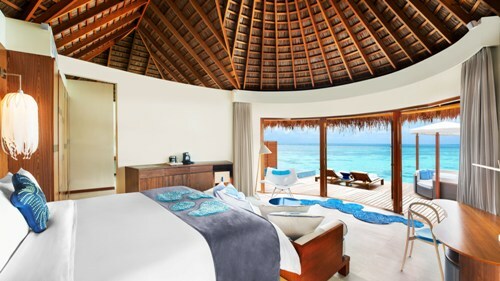 Browsing through blogs and forums finally led me to Kaani Village and Spa, one of the more popular hotels in Maafushi. The hotel derived its name from Kaani, a flower abundant in the Maldives that somewhat resembles a hibiscus. The vibrant color of the logo transcends to the friendly ambiance and lively smiles of the hotel's all-Maldivian staff. To date, there are 2 Kaani hotels that are currently operational in Maafushi with the third one due to open by end of the year. Once up, the newest Kaani Hotel will be the biggest and guaranteed to provide the best view in the whole island. Kaani Village and Spa may not be the ideal beachfront stay but their hospitality and excellent service certainly lives up to the high ratings the hotel earned from various travel sites. One of the considerations why I chose Kaani Village & Spa was because it offered a family room that can accommodate our group of 3 at a reasonable rate. Thru Agoda, we were able to book the room at a discounted price of about Php18,000 (Usd370) for 3 nights with extra bed and inclusive of buffet breakfast. 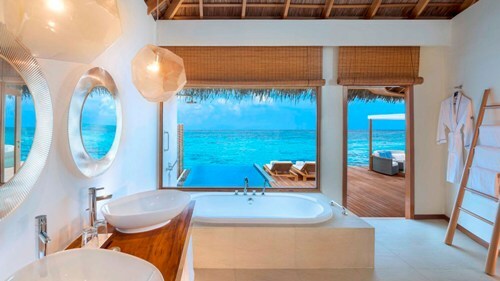 I know that there are cheaper hotels available in Maafushi but paying extra for a comfortable accommodation with full hotel amenities is certainly worth every penny. The family room has a single and 2 semi-double beds, an air-conditioning unit and ceiling fan, an LCD television with English cable channels, a mini bar with complimentary bottled water every day, a safety deposit box, a separate toilet and bath with basic toiletries and a balcony with a partial view of the ocean. Complimentary wireless internet is also provided but the farther you are from the lobby, the weaker the signal tends to get. It also drops out when your device is on standby but as long as it's free, inputting the 4-digit code will never bother me. Breakfast is served at the hotel restaurant on the lobby's second floor. It's open daily from 6am to 10am and thankfully, menu is changed every day with a few fixed items such as breads, eggs, butter and jam, cheese and fresh fruits. They say that a traditional Maldivian breakfast isn't complete without a serving of Mas Huni and Roshi on your plate! Mas Huni is a simple mix of coconut, canned tuna and loads of onions that is best paired with freshly baked Roshi flat bread. Pros: The only hotel in Maafushi with a pool and in-house spa, value for money room rates, spacious and modern rooms, well-maintained facilities, reasonably priced excursions and excellent customer service. I can't emphasize enough how hospitable and polite the staff and management of Kaani Village are -- the genuine smiles, their eagerness to help and going the extra mile even beyond their duty time, these are the things that you can never put a price tag on. Before I booked our ticket to Male, I had this misconception that Maldives is an expensive destination that I can only dream of. It may not be as cheap as going to Hongkong or Singapore but it is definitely attainable with proper planning and perfect timing. A lot of friends have asked me how much I spent for my entire trip and were all shocked whenever I say that my 4-day Maldives trip cost me about Php35,000 (Usd700) including airfare, hotel, excursions and meals. So yes, I am a living proof that Maldives on a budget is possible and I can't wait to share it with you soon!